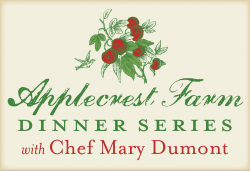 Hampton Falls, New Hampshire, for the very first Applecrest Farm Dinner. Cocktails, hors d’oeuvres and a hayride tour of the farm will be followed by a 4-course meal paired with wines from New Hampshire’s LaBelle Winery and beer from Throwback Brewery – all served in Nature’s dining room under the stars. 3) Choose a “pick-up site”. Yes, just pick one and, don’t worry, you need not pick-up anything. Chef Dumont and Todd Wagner of Applecrest Farm Orchards both grew up in Hampton Falls and are huge proponents of locally-grown, sustainable cuisine and farming practices. Over the years, the two often talked about how wonderful it would be to combine their talents and put on farm dinners in their own backyard. The idea was, and is, to build and support a community of sustainability in a town that they both love – all while giving back to some amazing charities. Four dinners will be offered throughout the summer and into the fall. Each will have a different theme and will be prepared by a different guest chef who will feature the freshest fare the Seacoast community has to offer. The first dinner will spotlight early summer’s bounty of hand-picked fruits and vegetables grown by Todd on Applecrest land. You might expect lovely English peas, tender micro greens, purple carrots, Chioggia beets, and sun-ripened strawberries. The seafood will be harvested off our own Atlantic shores on the day of the event by the local fishermen of Eastman’s Fish. Meats will come from happy cows, chickens, and pigs pasture-fed on pure sunshine and green grass at Hurd Farm – just a mile from where you’ll be dining. Chef Dumont also has some rare delights in store. The morning of the meal she plans to forage along Hampton’s remote tidal marsh for tasty sea beans and wild peas. And of course, cider donuts will make it on the menu. By attending an Applecrest Farm Dinner you will get to intimately know the plot of land your food came from and the farmers who grew it. You will be eating in harmony with the seasons and will no doubt enjoy the most-deliciously prepared meal of pure, fresh foods your taste buds have ever encountered. Beyond supporting local chefs, farmers and producers, you will also be doing your part to help local charities. A portion of the evening’s proceeds will go to the great causes of Lovin’ Spoonfuls, Seacoast Eat Local, Slow Food Seacoast and Future Chefs. Some of life’s best memories are made sitting around a table breaking bread. Mary and Todd sincerely hope you will join them in this unforgettable experience. One Farm Dinner not enough? Season passes are available for $500. Todd, this is the first newsletter (blog) I’ve received from Applecrest and I’m really impressed! The tone is so friendly and welcoming and reflects all the warm feelings I’ve experienced at Applecrest. You’re doing a terrific job! This week’s farm dinner was fantastic. Applecrest is such a special spot. Congratulations on wonderful event, I look forward to attending future dinners!! « Webstore is Up and Running!